If you have a child who is interested in playing the guitar and wants to worship, then the Jean Welles Worship Guitar Class is a valuable learning tool. Having musical children who serve on different worship teams, we know how important it is to train future worshippers while they are young. Combining familiar worship songs with excellent techniques and step-by-step instructions make this series an outstanding choice for the busy family. 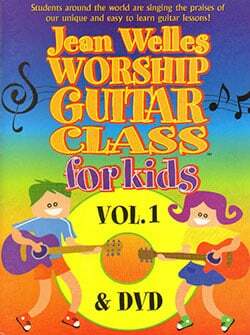 Jean Welles Worship Guitar Class for Kids DVD is available for younger children who want to learn guitar. This 4 Volume DVD/Book Bundle has one of each book and DVD in Volumes 1 to 4. Both English and Spanish are on the DVD. 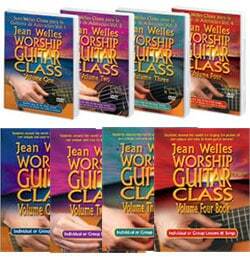 The Worship Guitar Class 4-Volume DVD Bundle has one of each of the DVDs in Volumes 1-4. 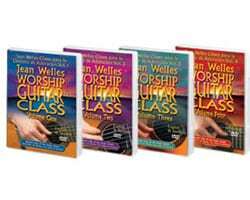 The Worship Guitar Class 4-Volume Book Bundle has one of each book in the series. The Volume 1 DVD/Book Set includes one book and one DVD. 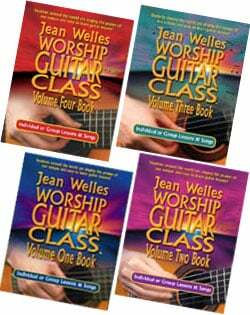 “With the Jean Welles Worship Guitar Class series, you can learn to develop a richer relationship with our loving Creator. Lessons 1 – 7. Learn seven worship songs, a dozen chords, and several strumming and finger-picking patterns. No music background needed. Both English and Spanish are on this DVD. “A continuation from Volume One. Lessons 8 – 14. Learn how to transpose songs into different keys with the I, IV, V chords. This video also covers bass runs, 12 new chords, half a dozen more strumming and finger picking-patterns with seven more worship songs. “In Lessons 15 – 21 of the series, bar chords are introduced. This video has 18 new chords, 8 of them are bar chords. Introduce new strumming and finger-picking patterns and learn seven more worship songs. 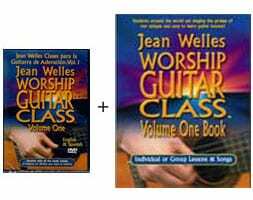 In Jean Welles Worship Guitar Class DVD 4, you’ll learn bar chord families, how to find chords anywhere on the fret board, and how to make instrumental arrangements. In the Worship Guitar Class 4 DVD, there are several new strumming and finger-picking patterns. Songs in this DVD include: Open The Eyes Of My Heart, At The Cross, Holy Lord, Shout To The Lord, plus three more.